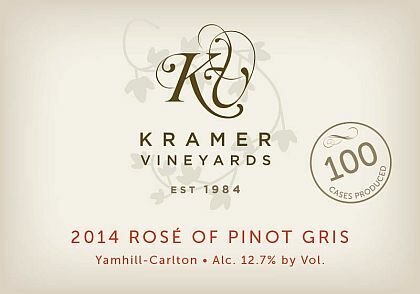 A bit of serendipity led the Kramers down the path to this rose. The family discovered a patch of Pinot Gris among their main block of Pinot Noir and saw it as an opportunity to create a rosé from Pinot Gris. The extended skin contact and four months on the lees leads to fun aromas of strawberry cola, tutti frutti, kiwi fruit, cranberry and pina colada. However, the drink is bold and bone dry with flavors of dried strawberry and white peach. That lees aging builds some richness in the midpalate that leads to a finish of red currant and solid acidity.